I’ve done it. I’ve dug up the Christmas Pippin. It didn’t take long – just over an hour to dig up, wash the roots clean, check for horsetail and pot up. 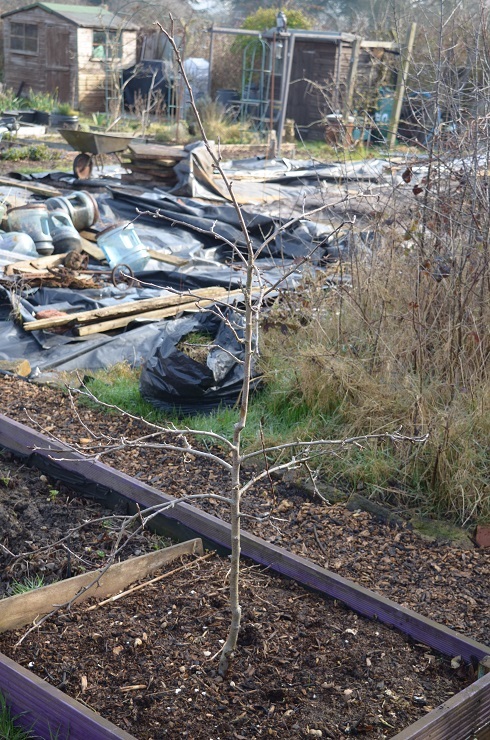 For a 6ft tree that’s been in for 2.5 years it had a very small root ball – even allowing for my having chopped through quite a bit. So I don’t think it much liked life over in boggy corner. I am anxious about its recovery – not just because of the apples, but also because it’s hosting part of my mistletoe experiment. For now it’s in a potato bag of compost, bonemeal and fertiliser, tethered to my Munty frame in lieu of a stake of its own. Fingers very much crossed. Next up is marking out the potential shed space and deciding whether moving it is something I really want to do. I have mentioned it in passing to Him Indoors. He’s less than thrilled, correctly anticipating what might be coming his way. 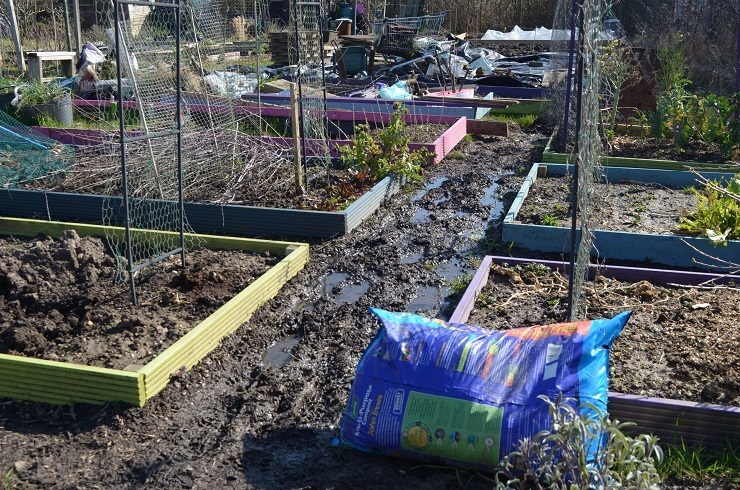 In a rush of enthusiasm I’ve sturdified the main path, skimming off all the mud & chucking it on the spud bed. If there are weeds in the gloop, that bed will at least get 2 hearty diggings over. It looks better too, replaced with more chippings over cardboard. Over in the greenhouse Val’s sweet peas are popping through steadily – I’m looking forward to plot flowers for home. though the arch they would usually climb has rusted through and fallen over. I have a forest of chervil, parsley, dill and coriander seedlings. The dill and parsley are next to each other and currently look worryingly similar. 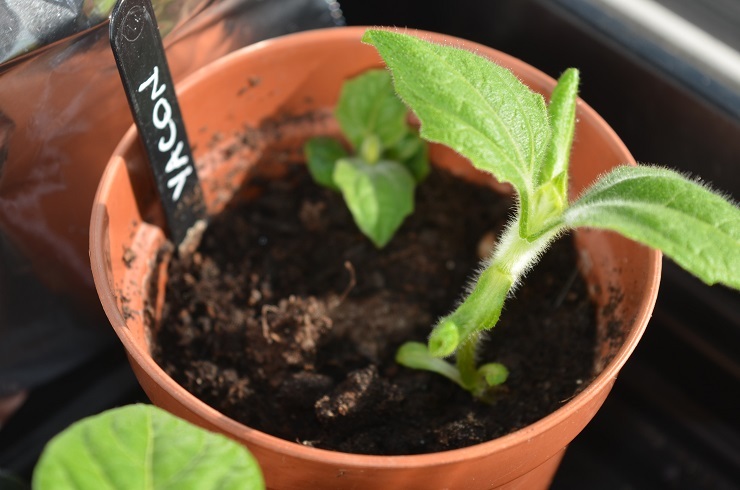 The HSL beans I sowed 3 weeks ago have some difference in germination – 100% for the field beans, 75% for the broad beans. I’ve also pricked out the replacement onions and have a complete set of trays again. Some of the onion roots were a little on the wee side – possibly due to fungus gnat larvae chewing at the roots? Given that it was so warm on Saturday I daftly put out my fennel on #92 without hardening them off. Today I have no fennel, but plenty of slimey trails around where they were. At home the aphids are really moving in. 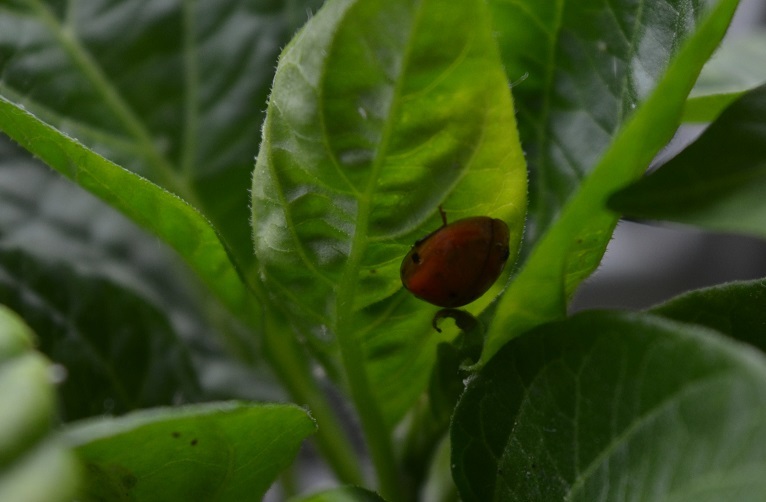 I’m squishing them daily and I’ve enlisted the first recruit in my anti-aphid army. If I can catch any more they are joining Private Spot for a slap-up dinner. Everything is getting a move on with more light and a bit of warmth. 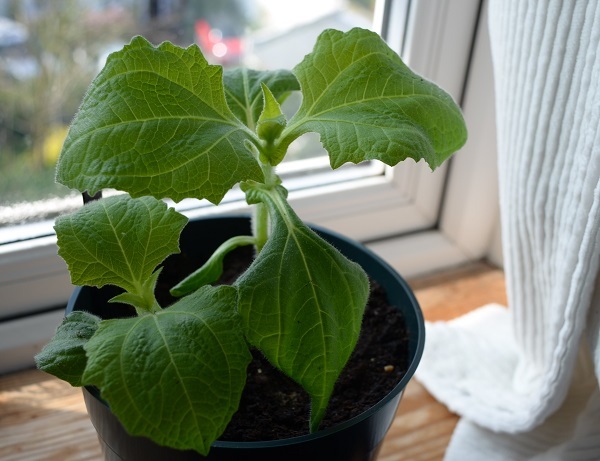 The yacon in particular has put on a huge spurt and has had to be repotted. I love the velvety soft leaves. But its growth rate does give me a hint of the beast it’s going to become. It’s gone from the picture on the left to the one on the right in 13 days. The most exciting development is the picture on the right. After a few months storage in the fridge (imagine my popularity! 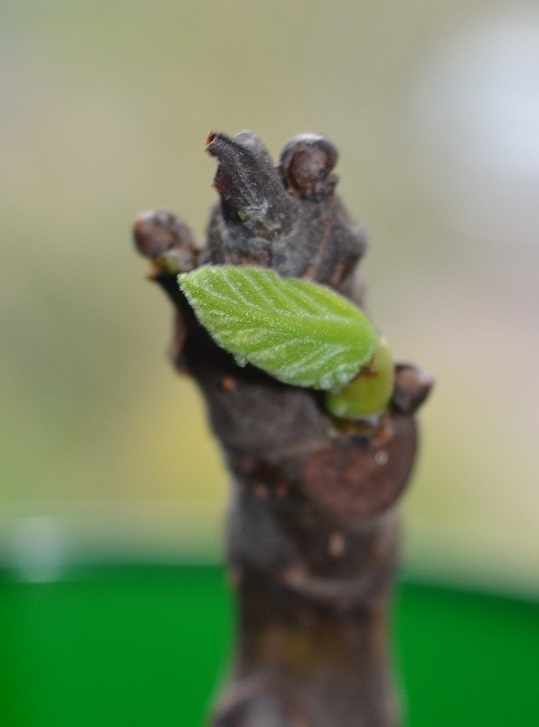 ), 6 weeks wrapped in damp paper till roots appeared and 3.5 weeks in damp compost/sand one of the fig twigs has sent out a leaf. It looks like a second is appearing on the other side. For me, this method was definitely harder than taking cuttings in Spring and sticking directly in damp compost, covered with a clear bag. I’ve had lots of problems with mould, with keeping them consistently warm enough, with stopping the paper drying out. Some horrible maggots hatched out on one of them – quickly relocated to the council compost bin. It’s been a lovely couple of days – lots of people up on site in the sun, getting plots ready for the season. Before I go off to rummage in the seed tins, there’s one more thing. We had a Committee meeting this week to prep for the AGM, and in AOB I mentioned my Kitchen Garden and GYO magazine reviews – waving the GYO one a bit excitedly. 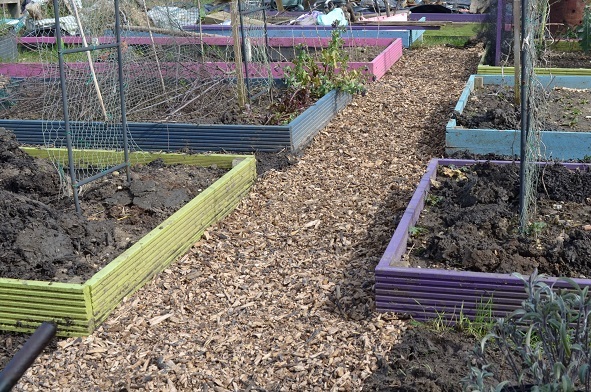 Our Allotment Sec has since emailed out the link to this and people have been lovely and said very kind things. Thank you very much, it’s really appreciated. Hi Richard, I do remember. I hope yours is as easy a job. Will keep you posted on tree survival. I got it out before this year’s buds started swelling so I really hope it recovers. Fingers crossed for you Beryl!